I love Old House Dreams. The owner of the blog. 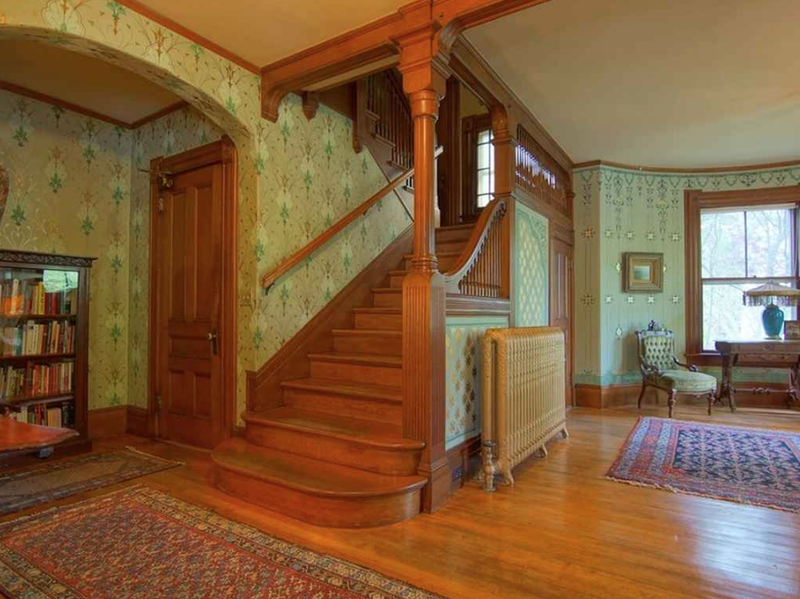 Kelly, does a wonderful job curating a list of fabulous old houses. 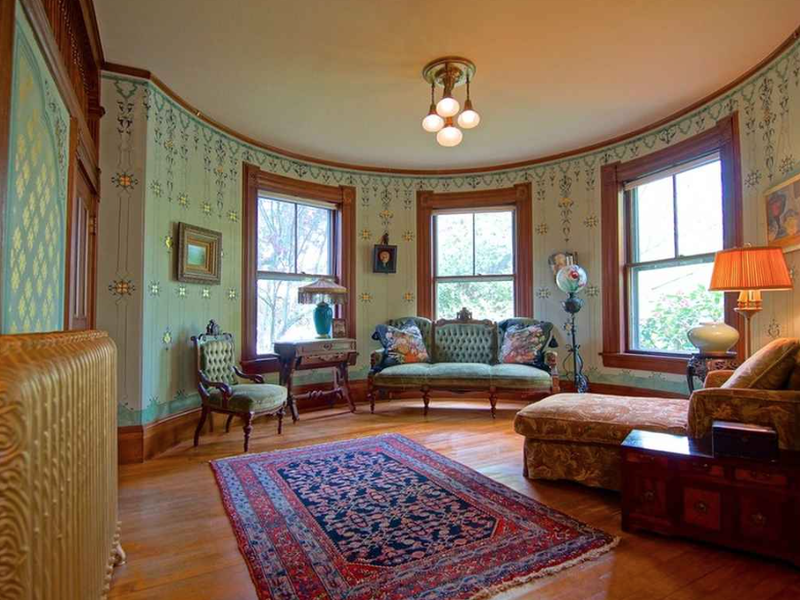 Many, if not most, of the houses have wallpapered rooms. But…99% of the time I really LOATH the paper. L O A T H. So, when the house in these images was featured I was astonished. I loved the papers! Love them! Just exquisite, right? These papers would look fabulous in the Cross House. But, I cannot find out who made the papers! Quite vexing! I believe the papers are relatively new (rather than vintage), but where can I find them? So, dear readers, anybody know???????????? The bit on the bottom right of the first picture really does look like a stencil. Good thinking! We can’t have Ross wasting his talents on a wild goose chase! Ross, if you read the intro to this house on OHD it does say “a turret living room with hand painted and gold leafed walls”. Beautifully done! I wish I could paint like that, I’d quit my day job and move to Emporia… just sayin’. Zounds! I never read that! So, my question SHOULD be: Where do I find these incredible stencils? Oh, the main paper in the second image? That does look like wallpaper. Hi Ross. Wonderful paint job!! – I agree – wow. So it isn’t wallpaper – I generally detest 99% of all wallpaper. I was thinking of you earlier this evening, so want to wish you a very Merry Christmas and Happy New Year. May the adventures continue! Ross, the home’s listing agent would most certainly put you in contact with the owners. They can probably tell you all you need to know, and more, about the paint, paper, stencils, etc. I love the look of this house too. I love the idea of stenciling, but then I think I just wouldn’t have time to do it. Why can’t we old home owners have good access to period wallpapers that come in a VARIETY and AFFORDABLE? Is this really too much to ask? 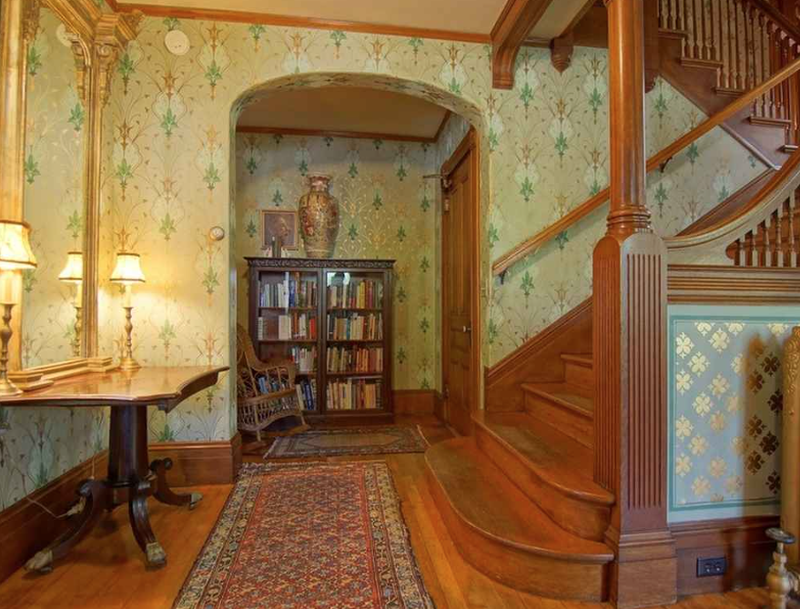 I love Bradbury and Bradbury wallpapers and have 1 in the house, but gosh I can only afford to do it in a vestibule, let alone an entry hall/stairway or a full room. Sigh why is making a comfortable period home so difficult from behind the walls to decorating the walls? Screw the wallpaper. There’s your period kitchen – OMG. And a 9 room cellar – AAUUGGGHHH!!!!! You can make a stencil if needs be. Yes, and for several decades now. They offer gorgeous papers.